The Alex Moulton Charitable Trust trustees are pleased to have been able to offer two scholarships, by sponsoring young budding engineers. In 2016 the Trustees provided funds for Luke, after his showing great promise in his studies and interest in engineering. 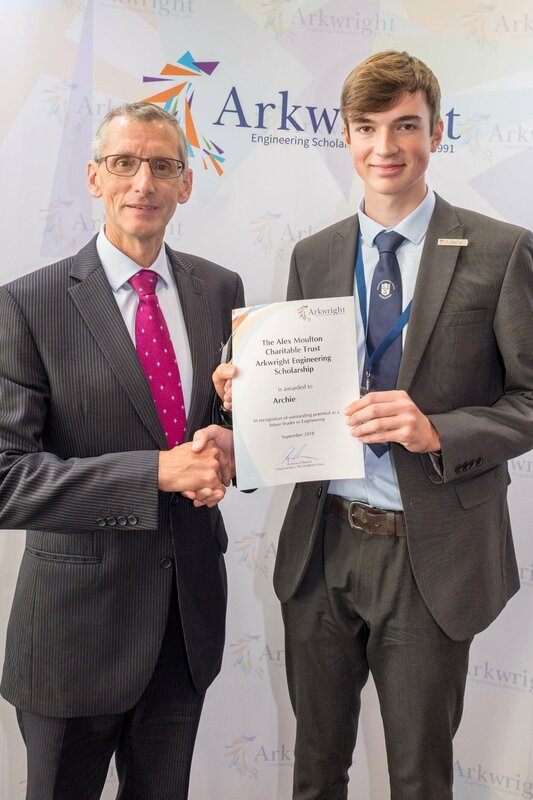 Due to this success, the Trustees have recently agreed to sponsor another Arkwright scholar and are delighted to have recently been able to provide funds to help Archie develop his interest in engineering, and forthcoming studies. The Trustees hope that both boys will go on and develop into budding engineers as their work progresses. It had been encouraging that such quality local candidates have been available through the Arkwright Trust initiative which is aimed at 15 – 16 year olds. Steve Missen, chair of the Alex Moulton Charitable Trust, made the presentation to Archie at the Institution of Engineering and Technology in London at the end of October. Congratulations Archie!